Join us to celebrate 150 years of the MSU Band Program! To commemorate the occasion, we will have additional events the weekend of our annual Fall Reunion, in additional to the traditional Homecoming events. And, our goal is to double the number of Alumni that normally return, so please consider joining us – and bring a couple of friends! Our big weekend is September 27-29, 2019, and we welcome Indiana University for the Saturday game. However, Alumni Band begins this year on Friday, September 27th when we rehearse with the Spartan Marching Band. We’ll follow that up by participating in the Homecoming Parade that evening, in addition to a reception at the MSU Union later that evening. 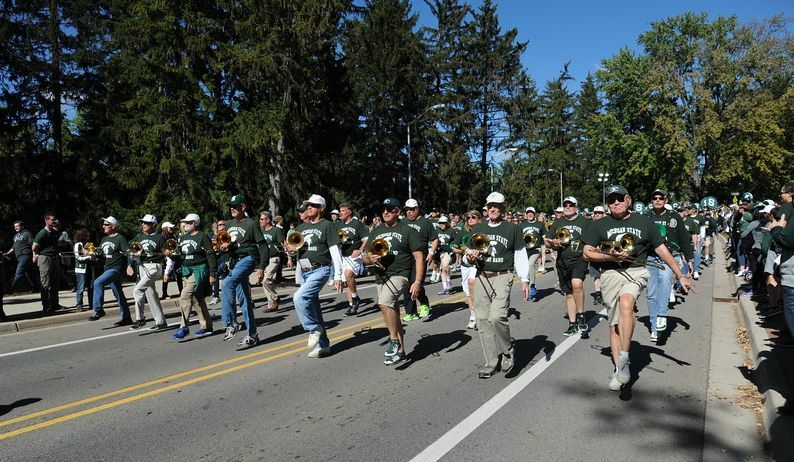 The only requirements to be part of this great tradition is be a member of the alumni band, and to have participated in any musical ensemble while at student or instructor at MSU. Not a member? Write us at alumband@msu.edu, or call 517-351-4582 for information on joining. And, watch for registration information in summer, 2019 to be part of the reunion. We look forward to our returning and new members, as we celebrate 150 years of the MSU Bands!